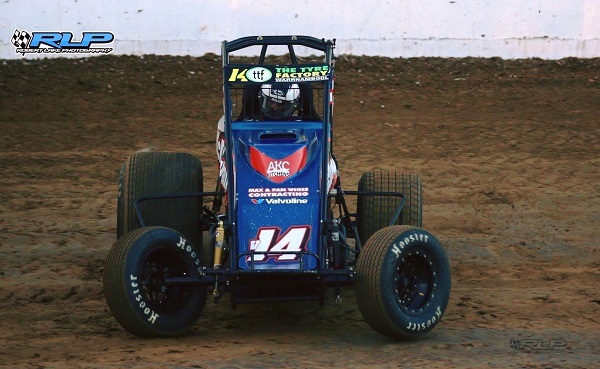 The impressive debut Wingless Sprint season continued for Alex Ross, after he claimed a commanding victory in last Saturday night’s Stonypoint 5000 event at Darlington’s Mid-Western Speedway. A good field of cars made the trek to the Darlington track, but it was Ross, who has had a very strong rookie season to date which has included a win and a pair of minor podiums to date, and the Warrnambool-based racer proved too strong take a flag to flag win ahead of Daniel Storer in second and Carly Walsh in third. The 20-lap feature race saw Ross assume the pole position with Storer on the outside. The second row was filled with Glenn Watts on the inside and Bhoe Paterson on the outside while the third row was made up of Walsh and Clint McLaren. At the drop of the green flag, Ross and Storer were battling hard for the lead, completing the first lap side by side. As the came across the line for the second lap, Ross edged ahead and proceeded to open up a gap over Storer. Despite a stoppage on lap 12 and another stoppage just a handful of laps from home, which bunched the field up on both occasions, Ross managed to drive away and at the fall of the chequered flag, was over two seconds clear of Storer. For second placed Storer, it continues a solid season for the Portland- based youngster. Although not having the passing opportunities in the feature-race, he looks likely to continue the remainder of the season in good form which includes leading the tough autObarn Series as it reaches the closing stages. In third was Cobden’s Carly Walsh, who put in a solid drive to stay in touch with the leaders for the entire race. After destroying a car in last month’s Victorian Title, she has certainly bounced back with some great speed in recent outings. Fourth across the line was former Street Stock racer Bhoe Paterson. Starting from position four, the Ballarat-based resident ran a consistent race remaining in fourth for the entire 20-lap distance. Meanwhile rounding out the top five was Chris Halesworth. The winner of two feature races this season, Halesworth, who started from position eight moved forward to record a top-five result. Rounding out the top-10 finishers was Clint McLaren, Brett Kuypers, Luke Schneider, Warren Sell and Mick Rigby. Following them was Steven Hateley in 11th followed by the remaining finishers Gavin Fitzpatrick, Glen Harris and Evan O’Bryan. Non-finishers were Robert Whiteside who was forced to withdraw with a flat inside left front tyre, Watts who was in contention until he hit the wall hard in the early stages of the race, withdrawing on lap 12 and Geoff Cook who failed to complete a lap. Earlier in the night, heat race victories went to Ross (x 2), Storer (x 2), Watts (x 2), Paterson, Walsh, Wayne Logue and Watts. The next appearance for the Victorian Wingless Sprints will be a two-night Easter Long Weekend show at Rosedale Speedway on Good Friday (March 30) and Bairnsdale Speedway on Saturday night (March 31) for the annual Gary Bowden Memorial, which will see the Bairnsdale event incorporating the re-run of the previously washed-out fourth autObarn Super Series round.